What Is This Real Estate Market Up To? Unless you follow real estate closely, what a regular day-to-day Buyer or Seller sees and those who are actively involved in real estate see is intense to say the least. For roughly 7 years, home owners had the luxury of ultra-low interest rates. This meant mortgage payments were low, and home equity line’s of credit were handed out like candy. Then the mortgage regulations and foreign Buyer tax came into effect and the market stalled. May/June of 2017 was the first sign that the market was set for a cooling off period as prices plunged from its peak of April 2017. It was common to hear that those who had bought in March or April were backing out of their agreements because prices had dropped so dramatically, Buyer remorse was rampant. And who could blame them (other than the Sellers)? The struggle was real for any Buyer in Toronto and the GTA wishing to purchase a home prior to April 2017. Bidding wars and overpaying was the norm and the Buyer had to accept overpaying and hope for the best that the market would continue to climb. Those who had entered into an agreement prior to April 2017, were suddenly faced with the harsh reality that they had bought a home that would be worth significantly less once they moved in. Jump to present day, and the market is unrecognizable to what it was at its peak. Rising interest rates is the largest obstacle the real estate market faces today. The foreign Buyer pool has literally dried up and those who are buying today, are those who live and work here. The median household income for those living in Toronto and the GTA is not at a level that can afford most homes. 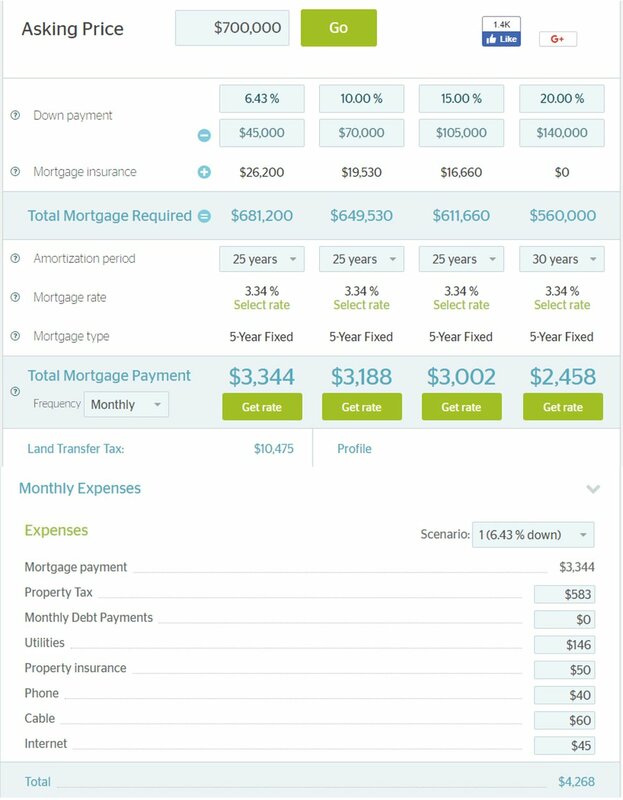 The image to the right is an example of what monthly mortgage payments would be. This scenario shows what it would cost to own a home with a purchase price of $700,000 and the minimum down payment of 6.43%. A rough estimate for the monthly payment which includes property tax, utilities, etc is $4,268. Stack a couple credit cards, a vehicle payment, and suddenly you’re looking at monthly expenses in or around $5,500. The minimum combined household income would have to be roughly $125,000 before tax. This is only if you have 0 debt. No car payments, no credit card debt, nada. But let’s be real. The majority of people don’t have the luxury of paying for a car out right, so there will be additional debt. So for arguments sake, let’s just say that to afford a home at $700,000, a combined household income would have to be $145,000 in order to qualify to buy a home with $6.43% down ($45,000). So what is the average household income for those living in Toronto and the GTA? It is roughly $100,000 as the income varies from community to community with some being higher and others being lower. Wait a second… If the average household income required for a home purchase of $700,000 is $125,000, then who can afford to buy a home? Great question! Each community varies in price that helps match affordability. Does this mean that you should wait to buy a home in an area you currently can’t afford? Short answer is no. Don’t expect affordability to improve anytime soon. Yes, it is possible that home values will drop over the next 5 years, however, interest rates will rise, so expect the monthly payment to remain the same. Are you looking to purchase a home and the prospect of purchasing a home is looking bleak? I can help. Maybe you have no issues with finances and you want sage advice, professionalism, and experience to assist you with your real estate needs. I can help.